When I saw the doctor at the Adirondack Health Wound Center last week, she recommended that I wear an Unna boot on my left left to speed up the healing of the open sore on my shin, technically called a venous ulcer. I said, "Why don't we put the Unna boot on both legs?" I also have an open sore on the right leg, on my calf. She agreed. So, for the past week, I've had Unna boots on both legs to speed up my recovery. Simply put, it's a form of compression therapy. In 1896, German dermatologist Paul Gerson Unna invented a "boot" consisting of low compression gauze bandage with 10 percent zinc oxide paste, gelatin, glycerin and water. That's wrapped around the leg first, followed by other wrapping to keep the boot in place. It needs to be changed every seven days. In essence, it's like a soft, temporary cast — a semisolid mold. The main drawback is that I can't get it wet. I've tried various methods of covering my legs with plastic in order to wash my body in the shower; however, I am unable to do that because of the way my fat is distributed in my legs. Therefore, I rely on a wash cloth for my daily body cleaning. Its a small price to pay for quicker healing. The other drawback is that I have to keep my feet elevated whenever I sit, and I can't stand still for periods of time. The doctor wants to make sure I do what I can in order to keep my legs from swelling. My job at the newspaper requires me to sit for long periods of time, so I've had to work from home, writing, editing, laying out the newspaper, etc. with my legs elevated. 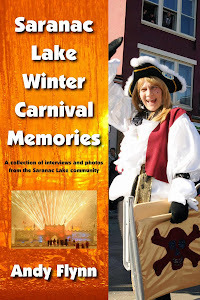 I can't travel in my car for long periods, but I can make quick trips between Saranac Lake and Lake Placid to take photos and conduct interviews for the Lake Placid News. The main benefit of using an Unna boot is that I don't have to stay in bed the entire time in order to keep my legs from swelling. Another benefit is that my legs are protected from potential scraping or bruising while they are covered with the Unna boot. The doctor recommends walking. The Unna boot provides high pressure when the muscles are contracted, pumping excess fluid out of my legs, and small pressure while at rest. So the more I walk, the better. When I woke up the morning of Monday, Feb. 20, I looked at the calendar on my phone, and it read, "Start Training for Half." That's shorthand for "Start training for the Lake Placid Half Marathon." I forgot I wrote that on my calendar a couple of months ago. I was being optimistic at the time. With my weight and ability at the time, I knew it would probably not be realistic to compete in the June 11 event this year, as I had done in 2014 and 2015, but I decided to start training anyway. 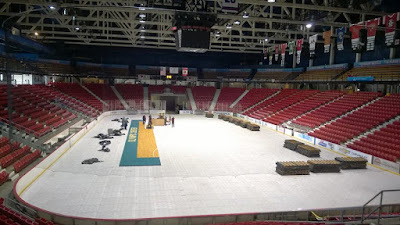 So, two days before the doctor put Unna boots on my legs, I headed to the Olympic Center to walk around the 1980 Rink in the Herb Brooks Arena. I surprised myself by walking 1 mile that day. That was the first day of training, not necessarily for the Lake Placid Half Marathon, but for some 5k in the late spring somewhere and a future half marathon, possibly in the fall, maybe the Lake Placid Classic. I can't wait to get back into competing in these races — walking, not running. 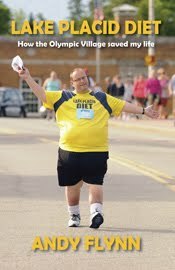 Eventually, I'd like to get back to the Lake Placid Half Marathon. I'm emotionally attached to it because it was such a big part of my weight-loss success in 2014 and 2015. On Wednesday, the nurse at the Wound Center took off the Unna boots, and my sores were healing fast, so the doctor prescribed another week with the Unna boots. She was hoping the smaller wound on my right calf could heal by next week. Fingers crossed. I figured I'll be wearing Unna boots until my sores heal. In the meantime, I'm walking when I can. Last week, it was three times, including a half mile at the Saranac Lake High School track Saturday when the temperature was in the 50s (walking around goose poop and patches of ice). This week, I'll just keep plugging away, walking then resting, walking then resting. After all, these Unna boots are made for walking.